Australia’s first horses arrived here in 1788. Irregular shipments followed that initial cargo. Because of the conditions the horses lived under, only the fittest survived. Some horses died during the voyages. When horse racing was recognized as a sport in 1810, good quality thoroughbreds were imported from England to Australia. The name Brumby for Australian feral horses is thought to have been derived from a James Brumby who arrived on the Britania in 1791. James Brumby, born in Scotton Lincolnshire, was a soldier with the New South Wales Corps, he was also a farrier and it is thought that he was responsible for some horses in the early Australian Colony. The first horses were used for farm work, and contributed to the opening up of Australia’s pastoral land. Explorers used horses and bullocks for transport. Horses were later bred for the remount trade. 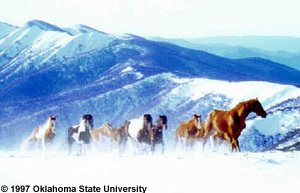 Brumbies are rarely of consistent size, conformation or color. This is because domestic mares may escape and join feral horse herds. Also, they were originally of mixed type, including Australian Draught and Thoroughbred. Because of the limited commercial need for these horses, regular culling is necessary, and studies have been carried out as to the most humane and efficient method. This culling is necessary not only to reduce the horses’ impact on cattle farming, but for the protection of the horse herd. 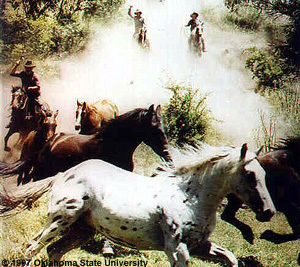 A large number of horses in drought conditions would suffer starvation, thirst, and may consume toxic plants. Horses have played an important role in Australia’s history. It is unfortunate that some became feral. It is up to us to control the size of the brumby herds, for their protection and our livelihood.